But the story of Disneyland begins before July 1955. Two years earlier, in July 1953, Walt Disney asked Harrison "Buzz" Price to calculate the optimal location for a new type of theme park, one with a single entrance, hidden from nearby streets, with custom rides that put storytelling ahead of thrills. Price analyzed 40 years of population data to determine that the best available 160-acre site in the Los Angeles metro area, with Interstate highway access, would be in Anaheim. Based in part on his success in siting Disneyland, Disney later hired Price to determine the location of Walt Disney World, which Price sited southwest of Orlando, Florida. Price, who passed away in 2010, went on to do feasibility studies that led to theme parks and new developments for Universal, Six Flags, Busch Gardens and SeaWorld. Walt's brother and business partner, Roy Disney, hired C.V. Wood, Price's boss, to build the park. An often off-color showman who could sell a sponsorship to most anyone, Wood brought Disneyland in on time and on its $18 million budget, but Walt fired him immediately after the park opened. "There was room for only one showman," Price wrote in his memoir Walt's Revolution! By the Numbers. "Their clash of egos was oil and water and Walt was the boss." Wood went on to build Six Flags Over Texas, helping to launch a boom of theme park construction across the country in the years following Disneyland's opening. Disney's decision to build his park around custom rides led to the development of a massive new industry in themed attraction development. Arrow Dynamics got its big break building many of the original rides in the park's Fantasyland, and in 1959, Arrow built the Matterhorn Bobsleds, the world's first tubular-tracked steel roller coaster, the innovation that sparked modern roller coaster development around the world. 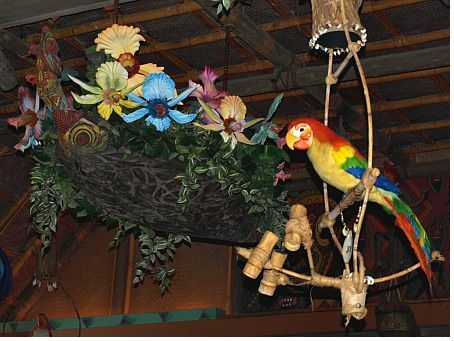 In 1963, Walt Disney unveiled The Enchanted Tiki Room, the first use of Audio Animatronics in a theme park attraction. An extension of animation in film, animated mechanical characters became a staple in Disneyland and other theme parks, with Disney introducing the first animated human character in "Great Moments with Mr. Lincoln" at the 1964 New York Fair. (The attraction later moved to Disneyland, where a successor plays to this day.) Also at the New York Fair, Disney introduced It's a Small World, which also moved to Disneyland after the fair, where it stands today, having inspired additional versions at every other Disney theme park resort around the world. Walt Disney died in December 1966, before the completion of Pirates of the Caribbean, in 1967, and the Haunted Mansion, in 1969 -- two animatronic-driven attractions that would become icons for the Walt Disney theme parks, with Pirates later inspiring a multi-billion-dollar motion picture franchise. The success of those attractions helped ensure the continued popularity of Disneyland even after Walt's death. As Disney expanded with new theme parks on the east coast, at the Walt Disney World Resort, and internationally, with Tokyo Disneyland, Disneyland continued to add new attractions in the 1970s and 80s. Disney added two new roller coasters during this time: Space Mountain in 1977 and Big Thunder Mountain Railroad in 1979. In 1987, Disneyland launched an industry trend in developing motion-base simulator attractions with the introduction of the original Star Tours ride. The early 1990s brought more popular expansions, including the wildly popular nighttime show Fantasmic! in 1992, and a new land, Mickey's Toontown, in 1993, inspired by the 1988 Touchstone (Disney)/Amblin movie "Who Framed Roger Rabbit?" Disney then brought motion-base technology to traditional "dark rides" with the Indiana Jones Adventure in 1995. While that technology helped inspire similar big-budget attractions at other Disney (as well as Universal and Busch Gardens) theme parks, Indiana Jones' debut in 1995 marked the high point for Disneyland before a period of decline in the late 1990s. The park's replacement for the wildly successful Main Street Electrical Parade, Light Magic, played to hostile reviews in 1997. The death of a Disneyland visitor on the Sailing Ship Columbia dock the next year, later faulted to a Disneyland manager's error, led to changes in theme park safety regulations in the state of California. The centerpiece of the 1998 Tommorowland update, Rocket Rods, failed frequently before closing for good in 2000. Disneyland's sister park, California Adventure, debuted to poor reviews and lackluster attendance in 2001. And Disneyland suffered five years of attendance declines, starting in 1996. But Disneyland recovered in the early 2000s, in anticipation of the park's 50th anniversary in 2005. Disney invested in ride refurbishments throughout the park, replacing the failed Rocket Rods ride with Buzz Lightyear Astro Blasters and completely rebuilding Space Mountain's track and interior. In 2011, Disney revamped Star Tours with a new version, Star Tours: The Adventures Continue, that includes 55 different narrative combinations. Park attendance (and prices) surged in the late 2000s and early 2010s, with attendance finally beginning to dip in 2012, as a multi-billion dollar refurbishment and expansion of California Adventure began to draw visitors to Disneyland's sister park in record numbers for the first time. Of course, many of those California Adventure visitors also find their way over to Disneyland, where the park remains popular - and crowded - throughout the year. Please share your favorite Disneyland memories, or hopes for its future, in the comments. June 19, 2013 at 6:21 PM · Nice summary, interesting to read the initial development of Disneyland, and amazing how quickly it was up and running from conception. One small point, you note that the attendance dipped in 2012, although its was noted in the summary of attendance figures that this is most likely a reflection of people's first attendance of the morning being in DCA (since the Cars expansion). Is there any actual attendance figures showing total numbers (rather than just first park attended for the day)? June 19, 2013 at 8:39 PM · Good point. I don't know of that data, but I'd love to see it, along with any data showing the number of "unique" visitors that come to a specific park in a given year (not counting repeat visits). I've rephrased the last line a bit. increase was driven by the opening of Cars Land at Disney California Adventure which boosted total visits to the park to 7.8 million, a remarkable jump of 1.4 million." June 20, 2013 at 9:04 AM · I'm afraid that still doesn't get to the total number of people who visited each park, since some of those resort visitors might have gone to one park only. But it does give a real sense of how the park has grown into a resort over the years. June 20, 2013 at 9:49 AM · Nice write up for the abridged history of Disneyland! It's always nice to see who influenced what era of DLR, and where the resort came from. On a side note, I'm always flattered whenever one of my photos is used in articles! Thanks Robert! I seriously get excited and then tell my other Disney friends! June 20, 2013 at 4:55 PM · The TEA reports don’t report attendance for Disney parks based on the first park attended when a guest uses a multiple-park admission ticket. Why would anyone calculate attendance in this manner? The idea that attendance is counted this way originated from a web site that uses questionable sources and they’ve never been able to back up their claim or explain the ridiculous logic of counting attendance this way. It’s just plain stupid. The purpose of the TEA reports is to put the parks on a level playing field for comparison sake. If Disney’s numbers are only counting park hoppers ticket holders for the first park they attended then the playing field is not equal for comparisons. Have you ever noticed that destinations with multiple gates that are included for a single admission price are listed only once, but those with multiple parks that charge a separate admission are listed individually? Disney has multiple ticket options – one-day, one-park ticket, multi-day tickets and what they call a Park Hopper ticket, which is essentially the same as buying an individual admission ticket to all of their parks for a given day, but at a discounted price. So this begs the question, if Disney charges extra to attend all of their parks then why shouldn’t your attendance count at each one you chose to visit? The simple explanation for the decline in Disneyland attendance is that fewer people chose to visit the park last year and very likely because of the new offerings at the park next door – California Adventure. June 22, 2013 at 6:47 AM · Mr. Niles writes: "Walt Disney died in December 1966 ..."